Since 1 November 2018, the European Patent Office (EPO) has been participating in the WIPO Digital Access Service (DAS) for the exchange of certified copies of previously filed patent applications (priority documents). DAS supports the automatic electronic exchange of priority documents within participating patent offices (participating offices). Applicants may request the depositing office (usually acting as office of first filing (OFF)) to make priority documents available to the DAS system and then request accessing offices (acting as office of second filing (OSF)) to retrieve the priority documents via DAS. The purpose of DAS is to establish a cost- and time-effective electronic system for processing and exchanging priority documents within participating offices, by relieving the applicant of the need to submit the documents to the OSF. The EPO currently acts as depositing and accessing office for European patent applications and as accessing office for international applications entering into the European phase before the EPO as designated office (OJ EPO 2018, A78). The President of the EPO has now decided that as of 1 April 2019, the EPO will also participate in DAS as depositing office for international applications under the Patent Cooperation Treaty (PCT) when acting in its capacity as receiving Office (RO/EP). Since 1 November 2018, the EPO will, automatically and free of charge, generate a DAS access code if the applicant files a request for the grant of a European patent (EPO Form 1001). DAS access codes are not generated for divisional applications. For European applications filed direct with the EPO via Online Filing or new online filing (CMS), the applicant will receive the DAS access code in a notification added to the acknowledgement of receipt of the request for grant. 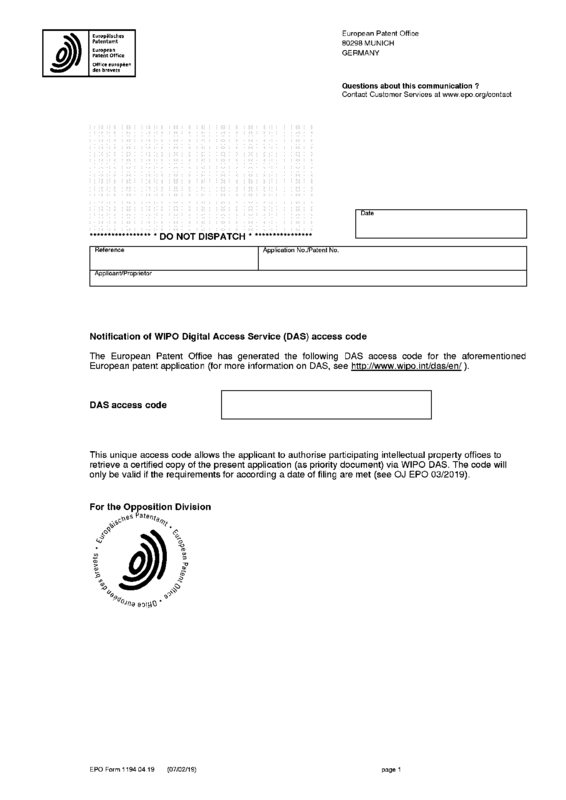 For European applications filed on paper, online via Web-Form Filing or with a national office, the applicant will receive the DAS access code in a separate notification (EPO Form 1194, see Annex 1). EPO Form 1194 will also be used to provide the DAS access code to those applicants who request that the code be resent to them. As of 1 April 2019, a DAS access code will also be generated free of charge for any international application filed with the EPO acting as RO/EP. The applicant will automatically receive the code in a notification added to the acknowledgment of receipt issued in response to the electronic submission of the PCT request (Form PCT/RO/101). For international applications filed on paper or online via Web-Form Filing, the applicant will receive the DAS access code in a separate notification (EPO Form 1031, see Annex 2). Where a request to resend the DAS access code is filed by the applicant, the EPO acting as RO/EP will provide the code with Form PCT/RO/132 (see Annex 3). The DAS access code is made available exclusively to the applicant and will be included in the non-public part of the file of the application. However, it should be noted that the code will only be valid if the requirements for according a date of filing are met. The code can only be used to claim the priority of the application for which it was issued. Since 1 November 2018, the applicant may request the EPO when acting as accessing office, i.e. as OSF (including when acting as designated office for international applications entering into the European phase), to obtain a priority document from a depositing office via DAS. 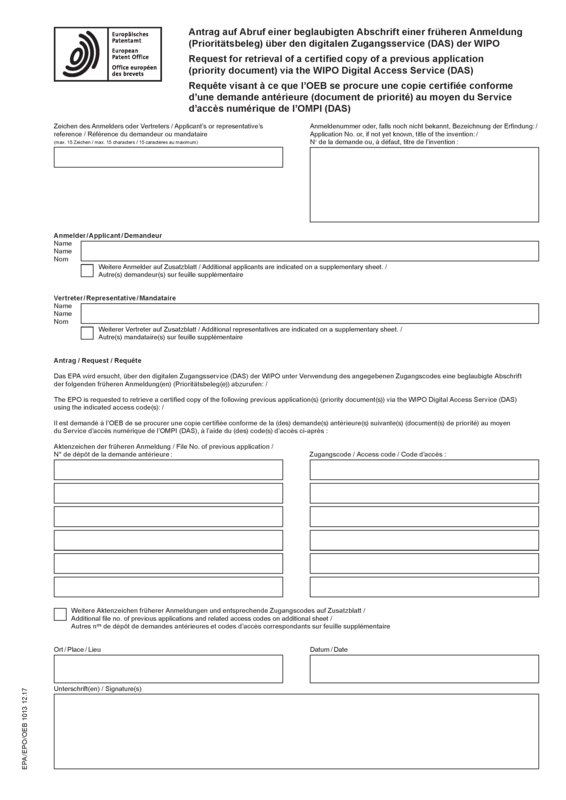 For this purpose, in the request for grant of a European patent (EPO Form 1001, Section 25) the applicant must indicate the DAS access code(s) corresponding to the previous application(s). Alternatively, the applicant may request the EPO to retrieve the priority document via DAS by submitting a separate request using EPO Form 1013 (see Annex 4). Once the priority document has been successfully retrieved and included in the file of the application, the document is deemed to be duly filed under Rules 53(2) and 163(2) EPC. It is important to note that the EPO does not inform the applicant if it was successful in retrieving priority documents via DAS. the EPO will automatically include in the file of the application, free of charge, a copy of the previous application from which priority is claimed. It will inform the applicant accordingly unless the previous application was a European patent application or an international application filed with the EPO as RO/EP. The applicant will be informed by the EPO in good time if a copy of the previous application from which priority was claimed could not be included in the file of the application; in this case, the applicant will have the opportunity to file the copy subsequently in accordance with Rule 53(1) EPC. As is already the case at present, an applicant filing an international application with RO/EP (acting as accessing office and OSF) claiming the priority of a previous application filed with a depositing office may request the International Bureau to obtain via DAS a priority document identified on the PCT request form (PCT/RO/101) pursuant to Rule 17.1 (b-bis) PCT. For this purpose, the applicant must select the applicable check box on the PCT request form (PCT/RO/101, Box No. VI) and indicate the DAS access code(s) corresponding to the previous application(s). 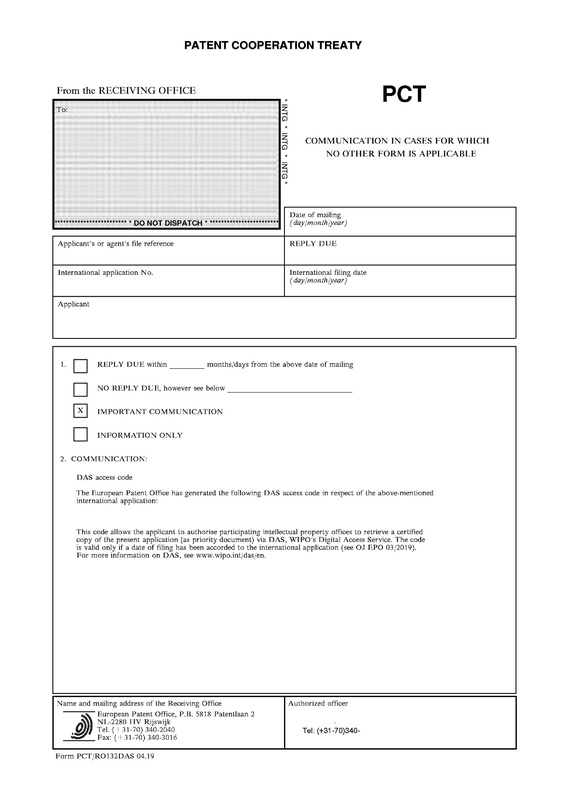 As is currently the case, an applicant filing an international application with RO/EP claiming priority from an earlier application filed with the EPO may request the EPO to prepare and transmit the priority document(s) to the International Bureau by marking the applicable check box on the PCT request form (PCT/RO/101, Box No. VI) in accordance with Rule 17.1(b) PCT. 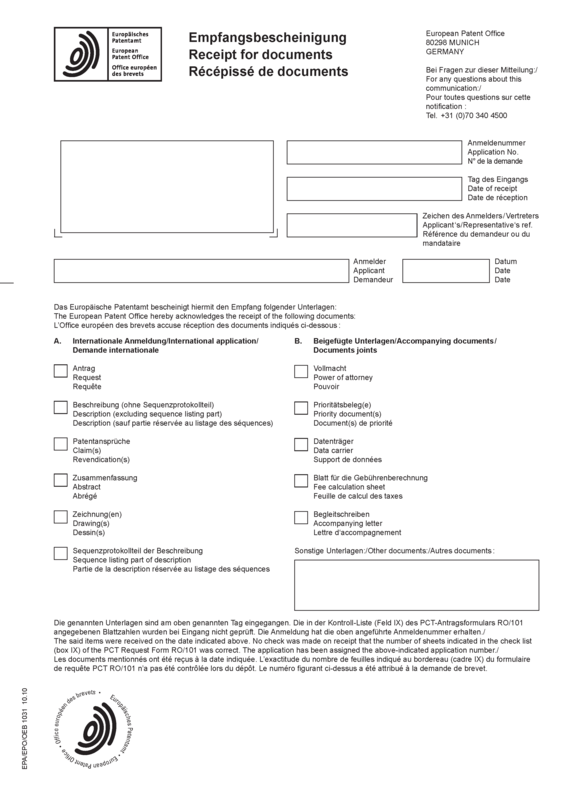 The fee for preparing the priority document will no longer be due if an applicant marks the check box indicating that the International Bureau is requested to obtain from a digital library a certified copy of the earlier application and indicates the correct DAS access code on the PCT request form (PCT/RO/101, Box No. VI) in accordance with Rule 17.1(b-bis) PCT. [ 1 ] This notice replaces the notice concerning priority document exchange via WIPO DAS published in OJ EPO 2018, A79. [ 2 ] OJ EPO 2018, A78. It should be noted that this does not apply to international applications filed with one of the other IP5 offices as receiving Office under the PCT.